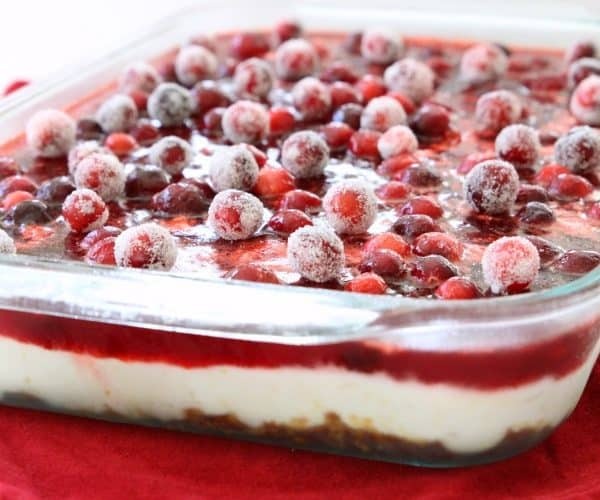 Cranberry Jello Salad is a staple to our holiday spread! I love the festive flavors. This version is perfect because itâ€™s not too sweet and accompanies ham and turkey beautifully. Itâ€™s a very versatile recipe too- if you canâ€™t find cranberry jello, feel free to use raspberry or cherry instead. You can also use a different flavor of pudding. I like to use white chocolate because of both the delicious flavor and the white color looks so pretty contrasted with the red jello. If you canâ€™t find white chocolate pudding mix, you can use french vanilla or even regular vanilla instead. Dovetailing Tip: Make on additional cup of whipping cream when making the whipping cream for this recipe. Save and use the extra day 5 in the Pecan Cream Pie. instead of buying canned cranberry sauce you could use the homemade Cranberry Sauce recipe from day 4. If you decide to do that, make sure to make enough to use that day instead of having to make more! Preheat oven to 400 degrees F. Spray a 9Ã—13 pan with non-stick spray. Transfer mixture to 9Ã—13 pan, spreading on top of baked pretzels, making sure mixture reaches all of the edges. Set pan in fridge to keep cool while you mix the jello.